Doing What You Like Is Being Who You Are! Why do you do what you do? Why do we really like doing some things and really hate doing other things while someone else likes and hates doing the exact opposite things? Are we weird or are they? From our perspective, we usually can’t understand how anyone can love what we hate. But yet, the evidence constantly proves that people like doing different things. Are we the only “normal” people on earth? According to Professor Steven Reiss, PhD., who created the Reiss Motivation Profile (RMP) ®, we are all most likely mentally “normal.” According to his comprehensive research, we are pursuing our individual mix of 16 primary needs/desires/motivations that are common in all human beings. I spent a couple of days with Professor Reiss and his wife Maggie, a school psychologist, learning how to help people interpret their RMP ® results and find Reiss’s work fascinating and highly helpful in describing why we tend to like what we like and do what we do. In general, to be happy and satisfied in life, we pursue our natural heart’s desires. When we temporarily satisfy our strongest desires, we are content and feel good. When we are unable to satisfy our desires, we become frustrated and this can lead to challenges in one’s sense of life satisfaction. As a RMP Master, I can coach people to help learn about what is most important to their sense of well-being and explore positive ways to pursue and fulfill one’s desires. If you are interested in completing a Reiss Motivation Profile ® and a personal RPM ® coaching session with me, please send me an e-mail at andy@lifematchesbook.com. Learning what will be most satisfying to you is an important first step towards living Fired Up! 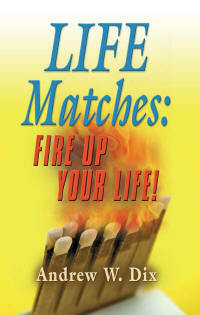 Get Fired Up About Living A Meaningful Life! Want to live life to its fullest? Do you desire to feel like you are flourishing and thriving and not simply surviving? Step one: Watch this TED Talk by positive Psychologist, Dr. Martin Seligman, PhD. Step two: Define “meaningful” for yourself. Step three: Do meaningful things daily that use your strengths and talents.